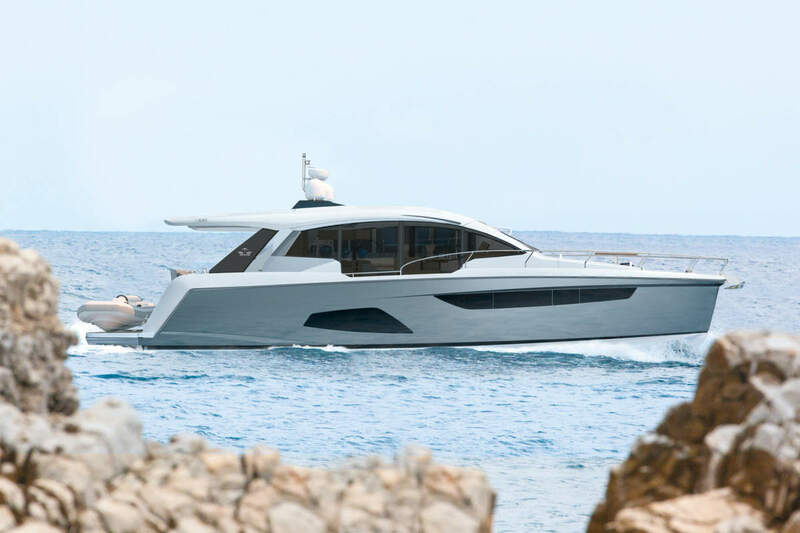 Designed from the keel up, using Riviera’s Uni-Graphics NX three dimensional CAD software system, the new 53 has been developed in-house after nearly two years of detailed consultation with boat owners across the globe. 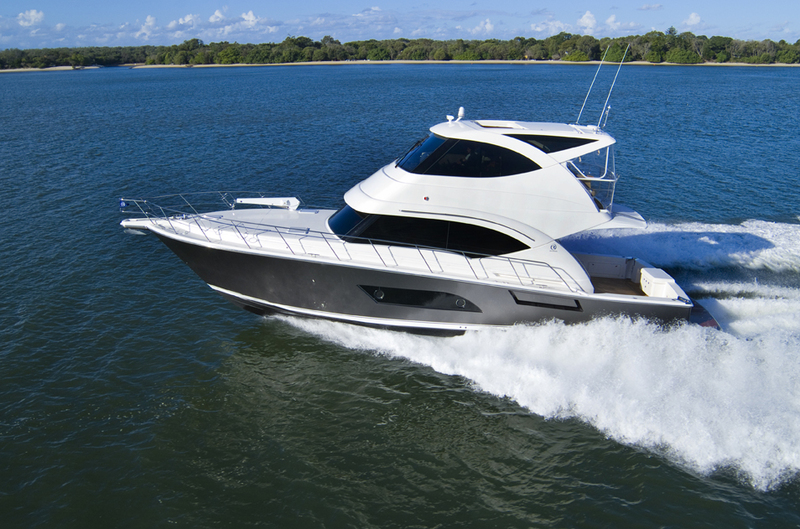 The result is a fresh approach, signalling a new generation of Riviera prowess and efficiency. 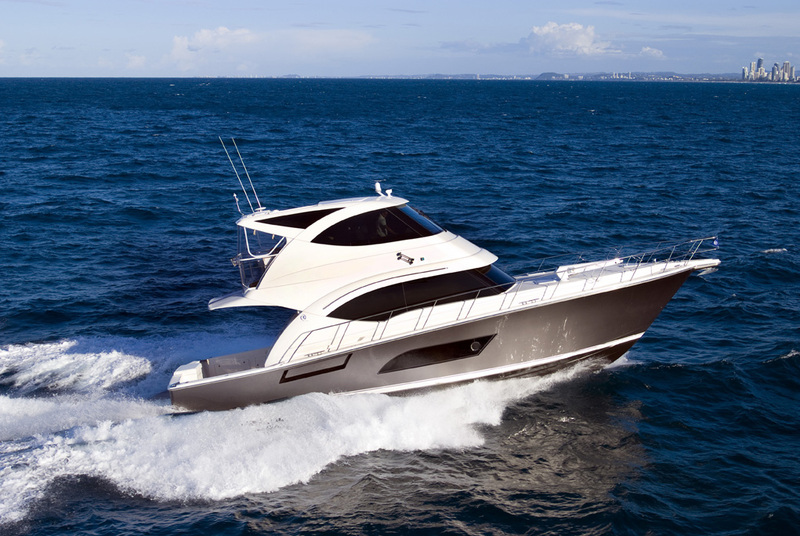 The 53 is a vessel of considerable internal volume, allowing Riviera’s designers to create unprecedented living spaces, elegant amenities and unrivalled performance. 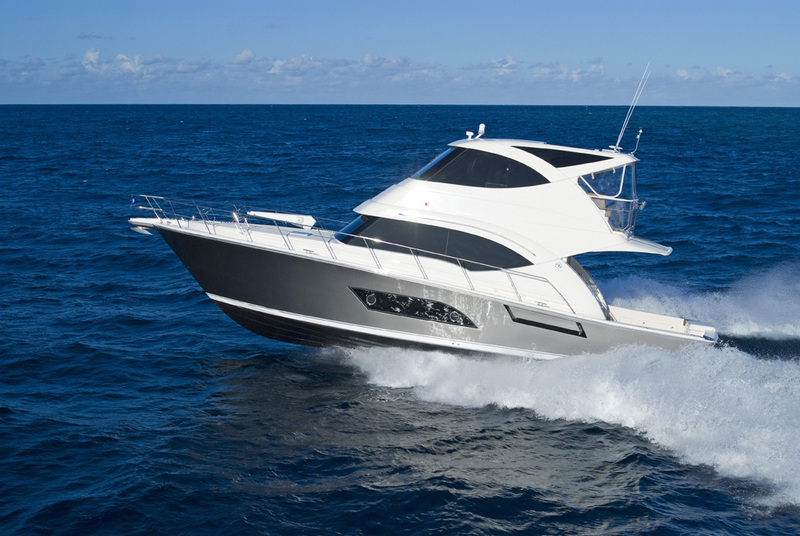 The 53 features hull lines that run straight aft from maximum beam, creating a powerful lift and planning surface along with great stability. Moulded window casings create style and function, bringing 360 degrees of light into the interior and offering water views from every saloon seating position. The Riviera 53 offers the latest in European appliances showcased in high gloss timber and solid surface bench top. Central to the galley is a Miele combination oven, featuring an induction cooktop, with microwave oven and electric grill. Proven Vitrifrigo drawer fridge and freezer along with Fisher and Paykel drawer dishwasher are all standard. 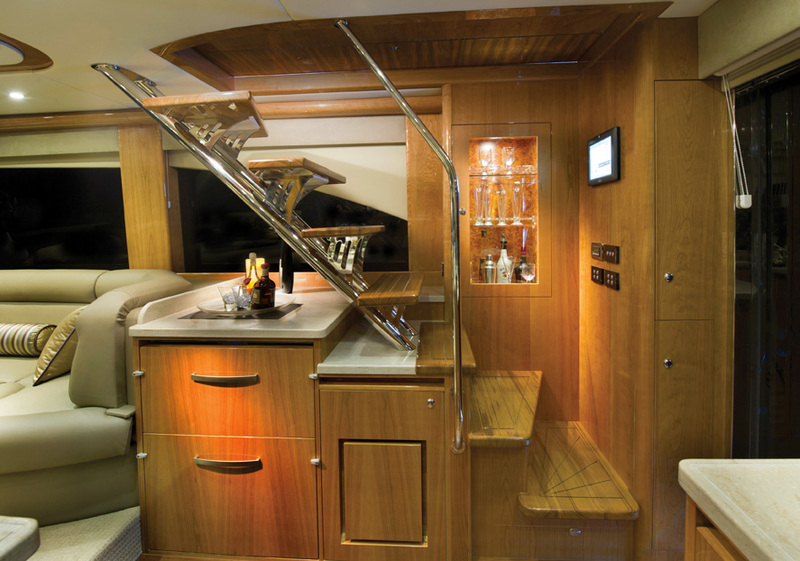 Opposite the galley, to starboard, is a wet bar featuring options for ice maker, drawer fridge and freezer, and a floor to ceiling pull-out Hafele pantry. All galley drawers operate on soft close runners. Also opposite the galley is a stylish internal staircase leading to the enclosed flybridge. Its floating teak treads mounted on solid stainless steel rails complements what will be a beautiful interior. 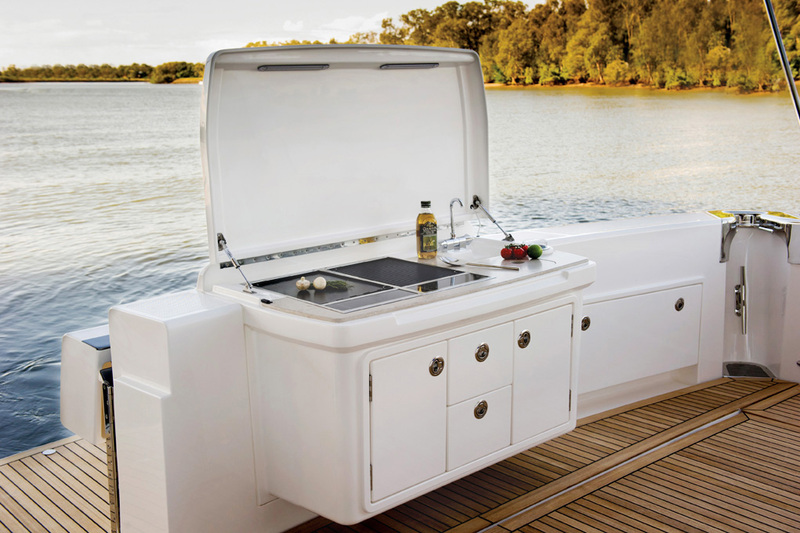 Forward of the galley is a C-shape dinette to port, that can convert into a double berth with a drop-down table. 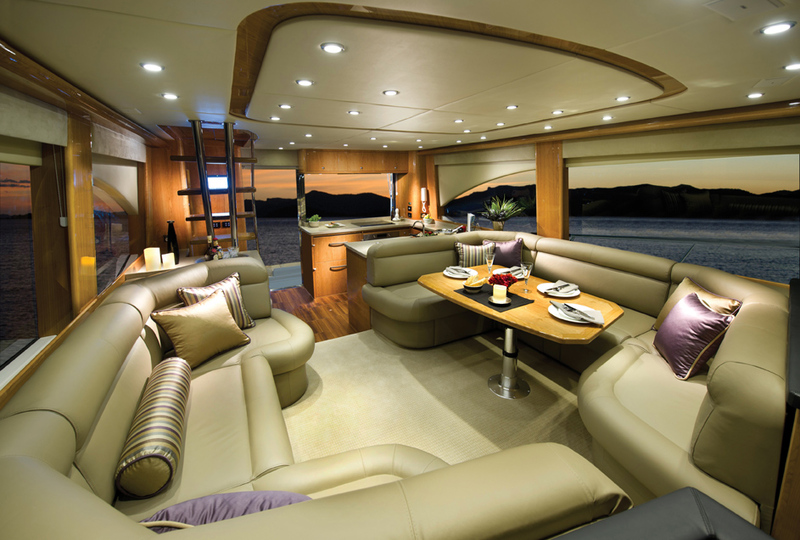 This arrangement faces a C-Shape settee on the starboard side creating a spacious social setting for up to 10 in sheer cruising comfort. 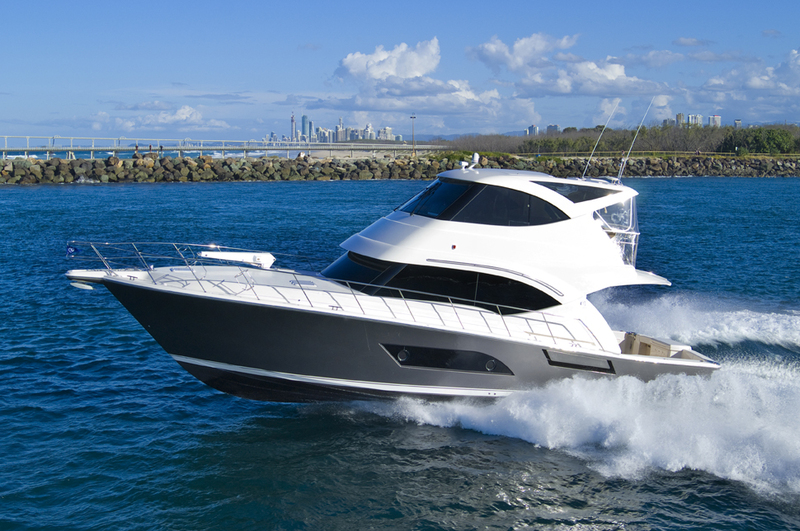 All of the lounges on the 53 are plush and luxurious, with a generous depth of padding. 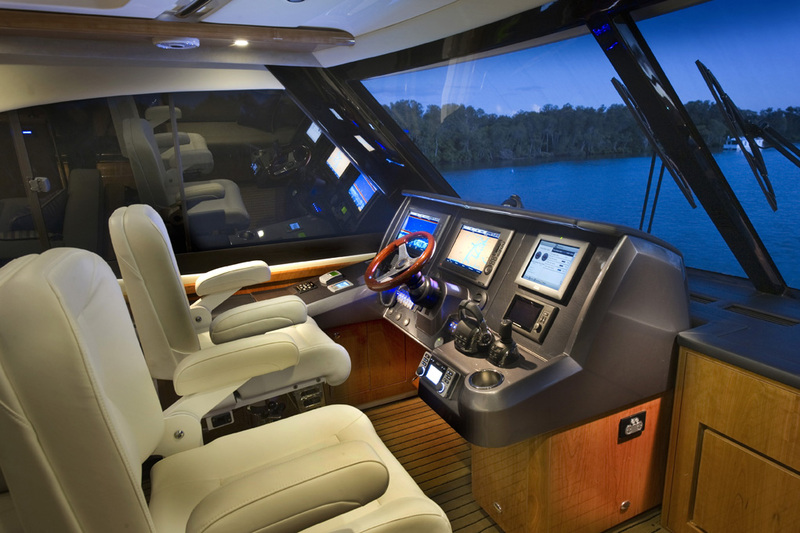 An option for a massive wide screen 50” TV on electric lift rises from the dash forward on the port side bringing sport and entertainment to the entire living area. 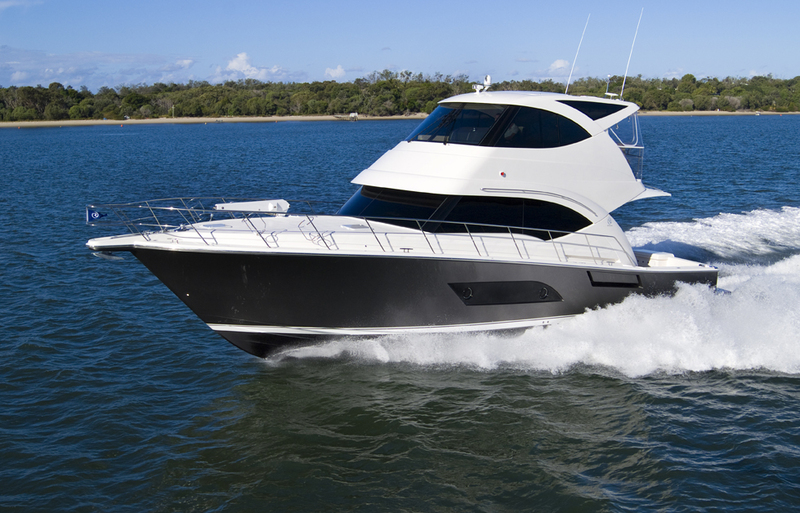 The flybridge is available in two options, with helm forward for long-distance cruising or helm aft, which many skippers prefer when sportsfishing. 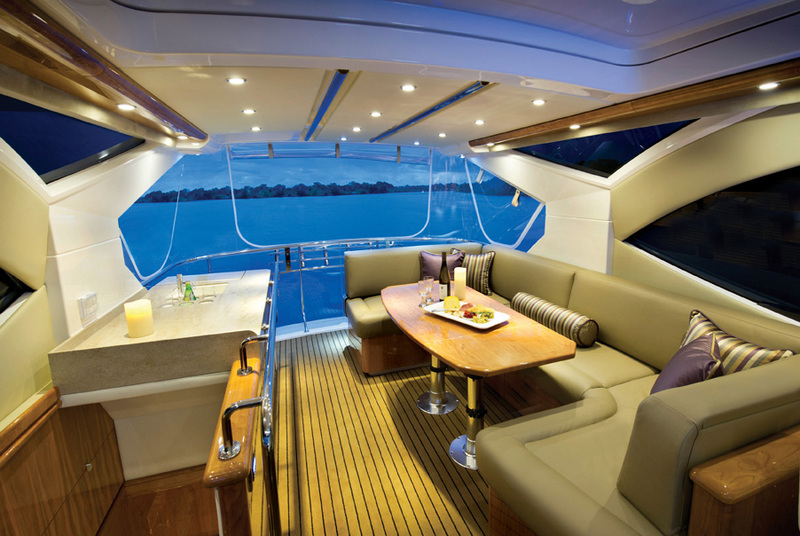 In either option, skipper and mate are seated on swivel pedestal chairs for maximum visibility. 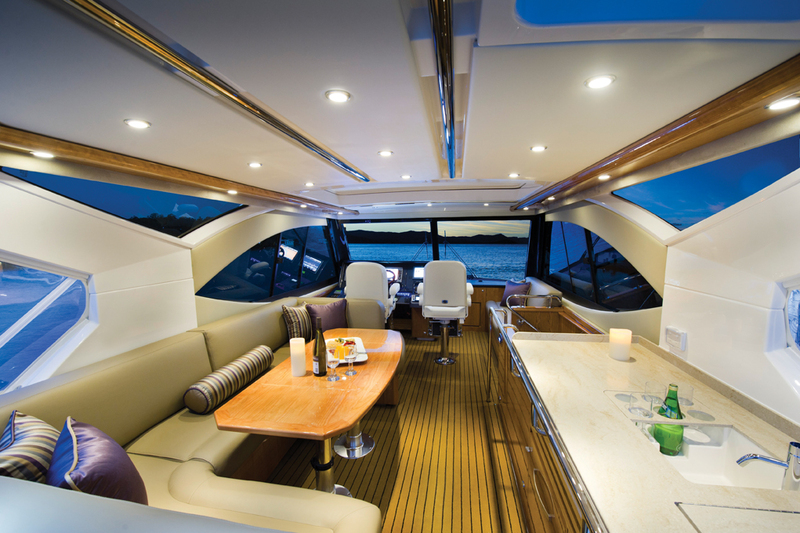 The roof of the flybridge boasts a sliding electric sun roof creating a sky-lounge, typical of much larger vessels. Side-opening windows and surround visibility will add to the light, airy atmosphere. The vessel’s massive engine room allows for flexibility of power plant choice, with the option for crew quarters or workshop isolated from the main living space. 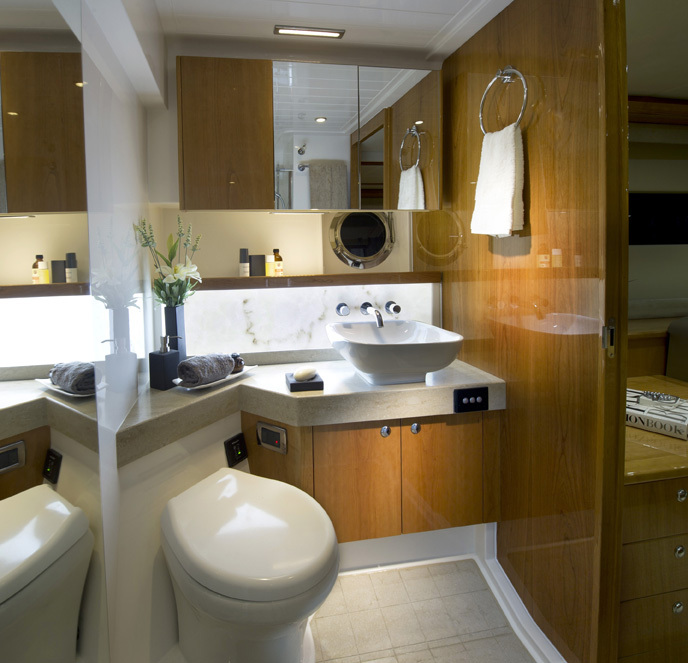 And the propulsion arrangement allows for maximum amidships space, which is used to deliver the most luxurious master stateroom for a vessel of this size. 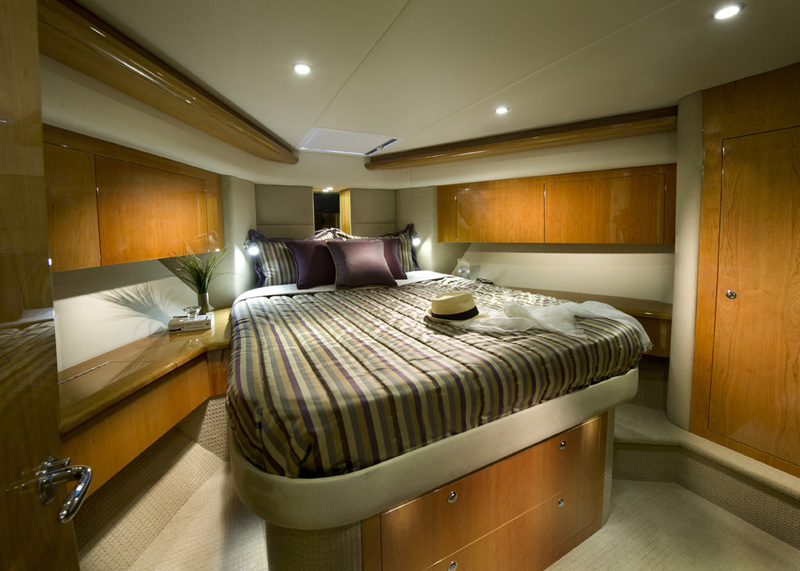 A large cedar-lined walk-in robe complements the master stateroom, which features a multitude of storage set behind high quality gloss woodwork – a feature of all Riviera boats. 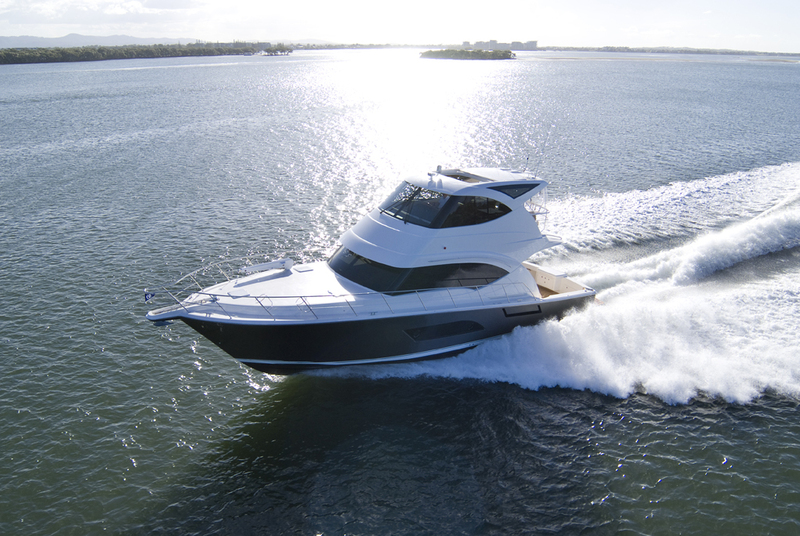 There is a massive 96,000 BTU capacity air conditioning on the new 53 reflecting the increasing use of Riviera boats in harsh tropical conditions. All venting and ducting is discretely hidden behind the stylish cabinetry. To balance the interior, the 53 features a clever combination of varnished wood and fabric panelling, to create a soft acoustic ‘feel’ with visual styling to match. Forward of the master stateroom is a guest stateroom, with a queen-size bed and wardrobe, and a third cabin with two single berths. 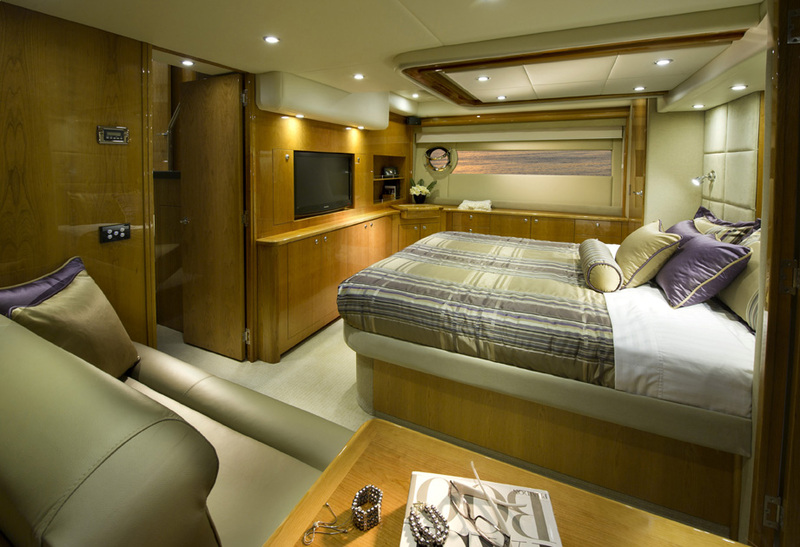 A separate ensuite serves the guest accommodation and doubles as the day head, making this vessel perfect for larger families, or holidays involving two couples with children. 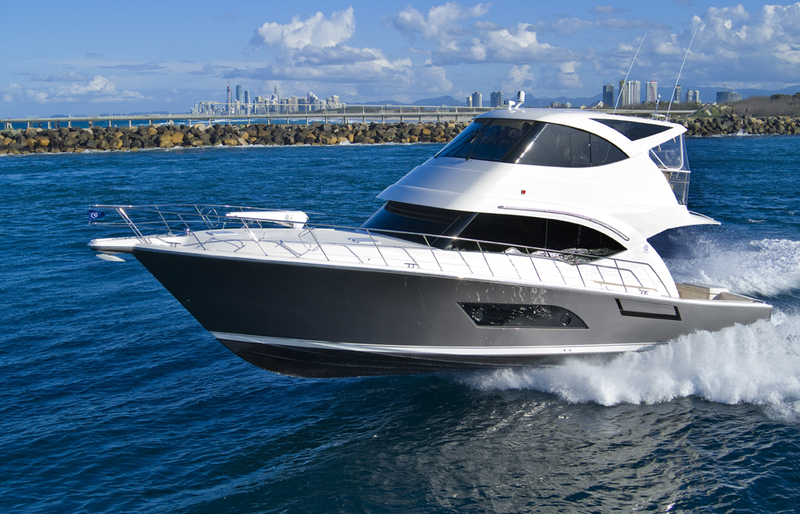 When it comes to propulsion, Riviera designers have settled on new-generation, fuel efficient pod drives to propel the 53 to a top speed of around 35 knots and a cruise speed between 25-28 knots delivering a range of 400 nautical miles depending on engine options on a 3500 litre fuel tank. 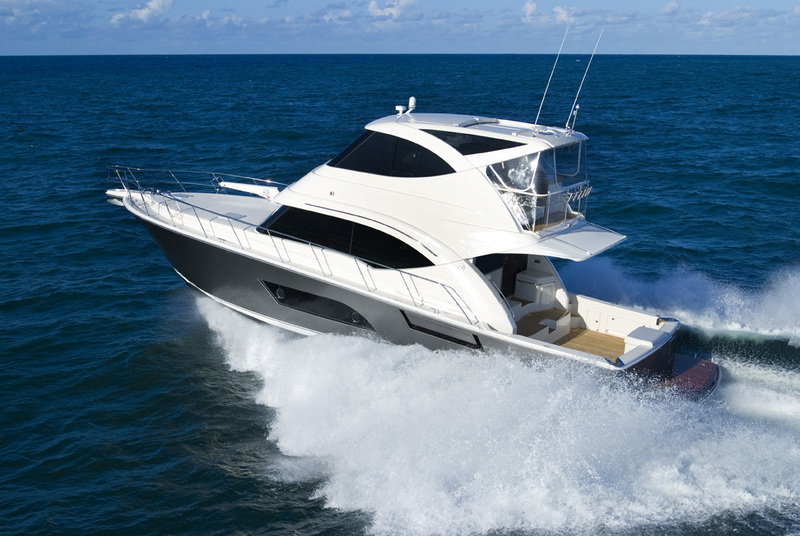 However, there are a number of propulsion options on the new 53. 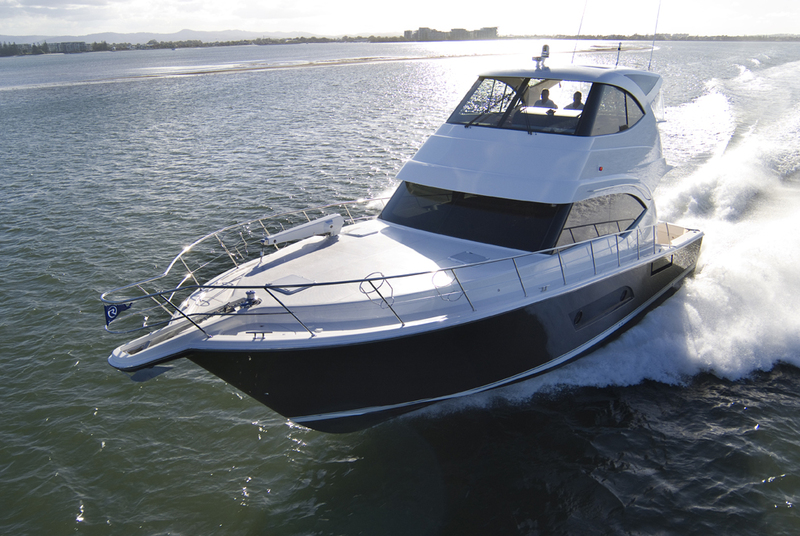 Up to 30 per cent efficiency gains are the hallmark of the proven Volvo Penta IPS system. There is the option to choose twin IPS 1200 units or three IPS 600 units. A further propulsion option is available using the ZF 4000 pod drive system, with twin counter-rotating Nibral (Nickel, Bronze, Aluminium) propellers facing aft, instead of forward as they are on the IPS system. Either way, the opposing blades – the forward blade pitched differently to its aft partner – make optimum use of wash and water movement to deliver a smooth, quiet ride. With the option of ZF drives, a customer can choose between Caterpillar or MTU power plants, with the option of twin 1015 hp C18 engines to achieve higher top speeds. 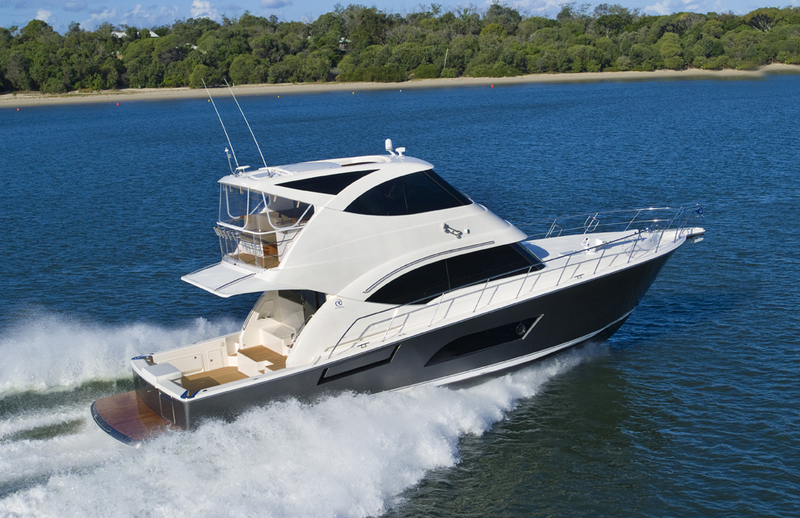 The 53’s hull is laminated using vacuum infusion to deliver an exceptionally sound structure that incorporates areas of solid GRP and various core materials, depending on engineering requirements. 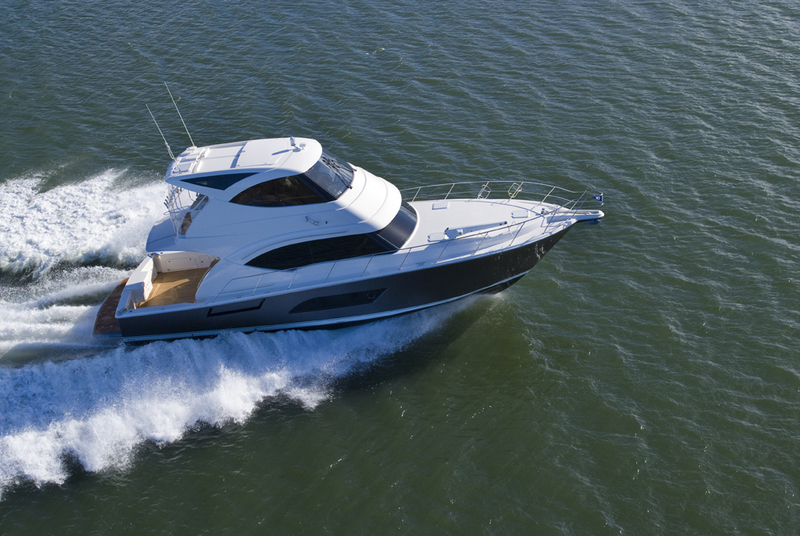 Infusion technology used in the hull also helps replicate the incredibly precise lines lofted from Riviera’s CAD computer system, and provides an accurate foundation for parts milled on a 5-axis CAD – driven router. Controlling all DC electronics is the digital system, a revolutionary Controller Area Network (CAN) bus design that allows for the ultimate in customisation and finger-touch control of all aspects of electrical operation, from entertainment lighting to navigation equipment. Great to see Riviera continuing to grow there ranges in such an agressive way especially during the difficult times that are still around its great testament to the company and the way they run in, great review also.